I’ve told you before, but I will mention it again, I am a big fan of hard boiled eggs. They are so simple to make and provide a quick energy boost when you have a busy schedule. I have been hooked on the 8 minute eggs, but then again I am always thinking of other creative ideas such as these Son-in-Law eggs. If you have never heard of Son-in-Law eggs, don’t worry, that’s why I am here to tell you about them, and after you make them, you can thank me. Trust me, these are wickedly awesome. I’m not too sure of the naming of this recipe, but it probably has something to do with having a man’s mother-in-law inflict a bit of fear into the man, that if you do not treat her daughter with respect and love, well, she will indeed inflect some fear into you and well, you probably get the point. But there is something beyond this, and something so amazing about the combination of flavor and texture that really makes this dish shine. This is a perfect use of hard boiled eggs, and believe it or not, the eggs are deep fried. Yep, deep fried. Who would have thought? The sauce has this great sourness and spice that when paired with the creamy deep fried egg and shallots, just blows ones mind. Again, trust me. 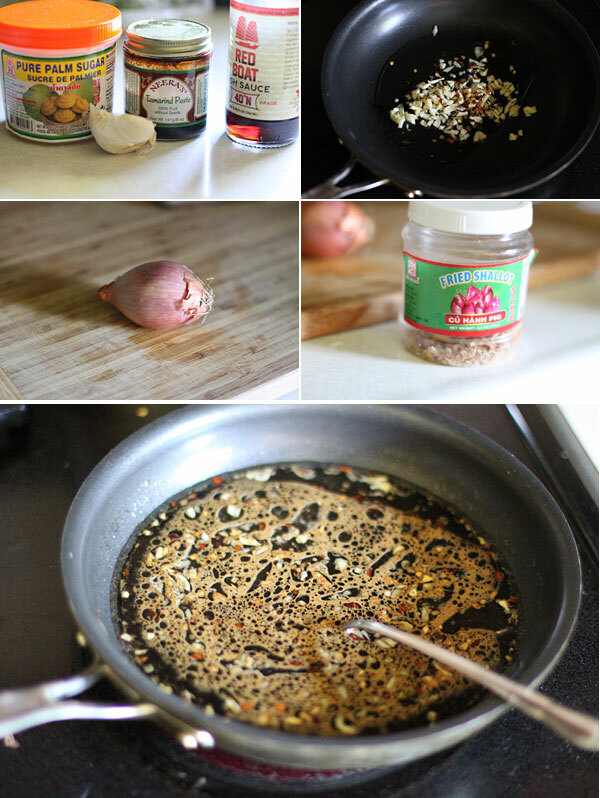 You will probably want to use the sauce on things like fried chicken or fish. It’s awesome. Start by making your sauce. Add the one tablespoon of cooking oil to a small pot. Bring to medium heat, then add in your garlic. Cook for about a minute, then toss in the fish sauce, palm sugar, tamarind, and chili pepper. Cook for a couple of minutes, then remove from the heat and set it to the side. Peel your hard boiled eggs. Heat another pot with the cooking oil on medium heat. After a few minutes, add in the thinly sliced shallots, and cook for about 5 minutes or so, until they are lightly browned and crispy. Remove with a slotted spoon and set them on to some paper towel to drain. Bring the oil back to about 350 degrees, then carefully add the peeled hard boiled eggs. Cook for about 8 minutes or so, until they are lightly browned. You can go longer if you want, but I always think they are going to explode. Once lightly browned, remove with the slotted spoon and let them drain on the paper towel, lightly patting. Slice the eggs in half and add them to a serving plate. 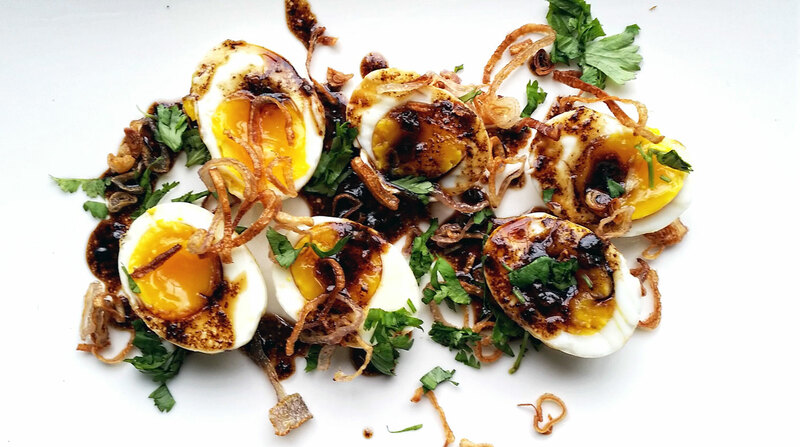 Shower the eggs with the fried shallots, then pour the sauce over the eggs. Shower with fresh cilantro and dig in. Feel free to serve with cooked jasmine rice if you desire. Again, the flavor combination is out of this world. Thai food at it’s best in terms of texture, and flavor. Hope you enjoy!